Wan (third left) hands over the baby milk powder and diapers to Iton at the SGH. 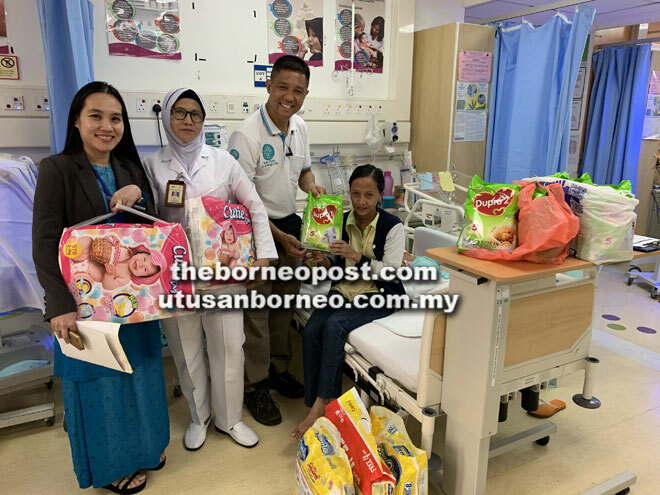 KUCHING: Hope Place, a non-governmental organisation (NGO) recently reached out to assist a four-month old baby warded at Sarawak General Hospital’s (SGH) Intensive Care Unit (ICU) here. According to its founder Kelvin Wan, Caroline Endak Melayu was born premature with intraparenchymal haemorrhage. “She has been warded at the hospital’s ICU since the day she was born. “We were informed about her case by SGH social worker Rachel Lawrence who said Caroline is in need of Dupro milk and diapers,” he said in a press statement yesterday. Wan said Caroline’s father, Melayu Banta, is a farmer living in Engkilili, Sri Aman. “With his small income, Caroline’s family cannot afford to buy the special milk for her. Hope Place currently supports more than 180 families by contributing essential food items like rice, cooking oil, sugar, salt, biscuits and noodles. The NGO carries out its aid deliveries once every three months because of the many families on its list of recipients comprising individuals with disability, single mothers with young dependents, abandoned senior citizens as well as those who earn a monthly income below RM500. For more information, Hope Place can be reached at its hotline at 013-5672775 or office number at 082-505987 between 8.30am to noon, and 2pm to 5pm (Monday to Friday) and 9am to 12pm on Saturdays.